The rationale behind the Tudor attempt to ‘reform’ the Irish polity and the Gaelic section of its population was provided by humanists variously inspired by classical ideas of government, civility and imperialism. The idea of patria or fatherland is one revived classical concept which has been touched upon in the debate about the ideological background to the completion of the English conquest. Given its obvious importance to the later development of nationalist ideas, this concept deserves further exploration. Patria was one of the easiest and least sophisticated of classical concepts to absorb because most school­boys learned their Latin through extracts from Roman auth­ors such as Cicero, Sallust and Livy in which the word and the values which informed it were commonplace. Brendan Brad­shaw has claimed that the ‘commonwealth’ reformers descended from the med­ieval English colony were inspired by this idea when they urged the reform of Ireland and its establishment as a kingdom in 1541. One prospective reformer petitioning Henry VIII in 1533 asserted ‘as I was born there within that your said land, learned the some little experience there, it provoketh me to that enterprise, coveting the weal of my native land’. The act for kingly title was enthusiastically greeted in Dublin but the first major deployment of the ideology came during war with France in Edward Walshe’s book The office and duety in fightyng for our country (1545). Though published in London, the book’s dedication to Lord Deputy St Leger, its reference to Irish rebels and subsequent import into Ireland by a Dublin stationer leaves little doubt that its target audience was the English-speaking inhabitants of Ireland. The book resulted from Walshe’s service in the large Irish contingent who fought in Henry VIII’s successful Boulogne campaign of 1544. Beginning with Cato’s precept about fighting for one’s country, he commented on the gifts bestowed by the native country and the grief of being exiled from it. Affection for the native soil was part of the law of nature. Since the primary duty was to one’s country, it followed that the worst crime was to betray it. ‘What inhumane, yeah rather what beastly, instinct should rule in us if we should have no affection of love rising in our hearts to our native country, whose father and whole generation and progeny is earthy and of the earth.’ He cited a large number of patriotic examples from Greek and Roman authors and also from scripture. But not only was Walshe exhorting military service on behalf of one’s country, he was also urging it on behalf of Henry VIII as supreme head of the churches of England and Ireland. He had made no specific reference to Ireland and saw his native land and church conjoined with England under the same monarch. This first invocation of faith and fatherland in the Irish context had come from the pen of a Protestant who wrote another book, now lost, entitled How Ireland may be reformed by the word of God. Whereas in the 1550s radicals such as Walshe supported the colonisation which was then getting underway in the midlands, patriotic language was also available to those commonwealth reformers who favoured a more integrative approach to the problems of the island. One Palesman demanding an end to divisive military policies and requesting a reversion to the conciliatory policies which had seen the country elevated to the status of a kingdom, refers to ‘my native country Ireland’ and to the Gaelic Irish lords as ‘my dear countrymen’. Later in 1557-8 Archbishop Dowdall and the Earl of Desmond mounted a similar attack on Sussex, the Queen’s governor, with the clergyman declaring ‘natural affection’ to ‘poor Ireland’. Sussex eventually got the chop but the policy of conquest and colonisation continued with much lip-service paid to the earlier ideals of integration. When in 1570 James Stanihurst, the speaker of the Irish parliament, regretted the abandonment of the bill to establish grammar schools in each diocese, he did so in terms of the benefits lost to ‘our countrymen’ (the Palesmen) and to ‘our unquiet neighbours’ (the Gaelic Irish). However his son Richard Stanihurst, in contributing the Irish section of Holinshed’s Chronicles (1577), did so because of the ‘love that I bore my native land’. He refers to himself as an Irishman and proudly defends his native country and its inhabitants against detractors. He admits to the barbarism and superstitiousness of the Gaelic Irish but does so on account of their lack of teachers and preachers. This phase had been an equivocal and inward-looking time for the Palesmen engaged as they were in ‘the country cause’, their long-running and acrimonious dispute with the state over the billeting and victualling of troops. However, the failure of the reformation and the emergence of widespread recusancy in the late 1570s and 1580s marked a significant change. This shift is observable in the later career and work of Richard Stanihurst. In 1581 he went to live in the Spanish Netherlands where he could freely practise Catholicism. There in 1584 he published De rebus in Hibernia gestis. He still distinguished between his own community whom he refers to as the Anglo-Hiberni and the Gaelic Irish as Hibernici but he does give an extensive and upbeat account of the latter, defending them from various slanders and applauding their religiosity. In 1587 as a further example of his piety and patriotism Stanihurst published a life of St Patrick. However other Anglo-Irishmen had already gone much further down the road of confessional nationalism. These included zealous Catholic priests, border lords of the Pale and cadet branches of the great feudal families lying beyond it. Thomas Jones, Bishop of Meath – he married O’Neill’s to Mabel Bagenal in 1591, negotiated with him in 1598 and wrote an answer to his proclamation in 1599. In the late 1560s and early 1570s a revolt of Anglo-Irish lords in Munster led by James Fitzmaurice Fitzgerald had been willing to offer the crown of Ireland to Don John of Austria and had in its later stages taken on religious overtones. After its suppression, Fitzmaurice went into exile but the sequel was fruitful ideologically. The straitened circumstances of the Marian exiles from England and the Calvinist refugees from the Nether­lands had led to their adoption of a faith and fatherland position. In the case of the exiled Irish nobles and clergymen, they fused the patriotic ideals associated with commonwealth reform with Counter-Reformation militancy which in the case of subjects of Queen Elizabeth was mightily reinforced by the recent papal excommunication. In 1577 Fitzmaurice went to Rome where he convinced Pope Gregory to send an invasion force to Ireland. However, the greater part of the 1,000 strong force under Thomas Stukeley joined King Sebastian of Portugal’s ill-fated crusade to Morocco, leaving Fitzmaurice with a handful of men and a few priests. He arrived Ireland on 18 July 1579 and began fortifying himself in the Dingle peninsula in County Kerry hoping to act as a catalyst by deploying ideology rather than sheer military power. Fitzmaurice carried printed proc­lamations in English and Latin, copies of the excommunication of Queen Elizabeth, statements of just war and circular letters to the Irish nobility. Dr Nicholas Sanders, the English Jesuit in his company, had a hand in composing some of these. Fitzmaurice also wrote letters in Irish requesting military support, some of which were intercepted. The line was that he was sent by the Pope to dispossess Elizabeth of her kingdoms on account of her heresy and tyranny and this honourable and patriotic deed could be achieved without the assistance of a burdensome foreign army if the country rose in unison. He asked for an assembly of ‘the princes, leaders and rulers of this our dear country’ to establish internal peace, end heresy and further the commonwealth. He alleged the support of Catholics in England and Wales and requested the assistance of all those that ‘have zeal for God’s honour and their country’ without delay. The combination of faith and fatherland was showing a clear development towards its formulation as a slogan. In a Latin proclamation Fitzmaurice claimed the necessary conditions for a just war—a good cause (against heresy), lawful authority (natural and canon law) and fair fighting (righting common wrongs rather than pursuing private ends). The Catholic crusader was killed in a skirmish by the Clan­william Burkes a month later but the English authorities overreacted to such an extent that Fitzmaurice’s cousin, the Earl of Desmond, was forced into arms. Desmond in turn wrote further letters including one to Feagh MacHugh O’Byrne desiring ‘you to take part with us, according as you are bound by conscience and nature, to defend your country’. O’Byrne was later involved with Viscount Baltinglass who, following a trip to Rome, raised a Catholic revolt in the Pale. The crown once again overreacted by arresting the Earl of Kildare and Lord Delvin which in turn forced Delvin’s brother, William Nugent, into revolt. The propaganda calling for a holy war for faith and fatherland failed to ignite a nation-wide struggle and in due course the Desmond and Baltin­glass revolts were brutally suppressed. It was an important development nonetheless—the new ideology had been propounded in Ireland and as a result it was transmitted from the Anglo-Irish camp to the Gaelic one. There were various lines of transmission. First there were the proclamations, circular letters and individual letters, dispatched by the Munstermen. These represented an unprecedented ideological pitch to lords who normally only acted in local petty disputes generated by immediate self-interest. In November 1579 a government spy found the population in Ulster more anti-English and more disobedient than ever with Turlough Luineach O’Neill railing against ‘the false supposed Queen of England, the Churl the Deputy and the false whore Marshal’. Another point of contact and probable transmission was William Nugent from Westmeath on the borders of the Pale. As a student in Oxford, he had composed poems of exile in Irish hankering after the land, people and religious ceremonies of Ireland; in revolt he was in league with Gaelic clans such as the O’Rourkes, O’Reillys, O’Connors and Mac­Geoghegans; on the run he was in France, Rome, Scotland and finally Ulster before his submission in 1585. The prison in which the disaffected were incarcerated was another point of transmission. In 1587 Red Hugh O’Donnell was kidnapped as hostage of the state as a restraint on the behaviour of his father and more particularly of his father-in-law, Hugh O’Neill. His biographer, Lughaidh Ó Cléirigh, records how, chained in Dublin Castle, ‘the descendants of the sons of Milesius’ and ‘some of the nobles of the Fingallians’ together lamented the wrongs and cruelties done by those ‘who came last from the country of the Saxons to take the island from both of them’. Many of the claims in this eulogistic biography should be distrusted but the treasurer’s accounts preserved in the Rawlinson manuscripts do show that O’Donnell together with Art and Henry MacShane O’Neill was at this time imprisoned with such Munster insurgents as Edmund Fitzgibbon, the White Knight, Donough Mac­Cormack, Patrick Fitzmorrice, Patrick Condon and John Fitz­edmond Fitzgerald. Another point of entry for the new ideas were clergymen returning from Rome and students graduating from continental colleges, some of which by the closing decade of the century had been specially established for Irish Catholics. We can include here such activists as Rochford, McCreagh, Magauran, O’Healy, Archer and Collins. The arrival of these new ideas of faith and fatherland in the mentality of the Gaelic elite are now beginning to show through in detailed studies of Irish bardic poetry of the period. The climactic phase of the Tudor conquest of Ireland—the Nine Years War between 1594 and 1603—resulted from the continued pressure on the great lords to ‘reform’ themselves after English models and to accept the full authority of the state in their localities. The revolt, focused on Ulster, the most Gaelic part of Ireland, was led by Hugh O’Neill and his son-in-law, Hugh O’Donnell. They were already in full control of their own territories, had gained victories over the English army and had the promise of Spanish intervention before adopting the ideology of faith and fatherland. O’Neill’s behaviour before the war is best described as ‘politique’. He described himself as a schismatic at the time the Palesmen were becoming Catholic recusants. In 1584 his Catholicism was evident when he celebrated Easter in Ulster according to the new Gregorian calendar but on trips to Dublin he would always attend Protestant services with the English governor. Now his military camp was attracting zealous Catholic priests. O’Neill had been brought up in the English Pale and having attended parliament would have been familiar with commonwealth rhetoric but prior to the war there is no sign that he showed any interest in political ideas. During the Nine Years War O’Neill imitated Fitzmaurice. He adopted the same ideology and used the same means of dissemination—circular letters and proclamations backed up by personal letters to recalcitrant individuals. Some of these are extant because they were either intercepted by or handed over to the state. In January 1596 O’Neill stunned the Dublin government by demanding liberty of conscience; in July he sent out a circular letter in Irish directed to the lords of Munster requesting their adherence to a military alliance ‘for Christ’s Catholic religion’. It was only when his forces began to threaten the Pale inhabited by a different ethnic group that O’Neill adopted the fatherland approach as well. The patriot ideology in the hands of a Gaelic Irishman was not guaranteed to win the support of the Anglo-Irish. In November 1599 after the disastrous governorship of the Earl of Essex had left O’Neill and his confederates in charge of most of Ireland outside the Pale and port-towns, a proclamation was drawn up directed at the English-speaking Catholics of Ireland. In it O’Neill threatened the recalcitrant with spoliation and dispossession but promised any new adherents that I will employ myself to the utmost of my power in their defence and for the extirpation of heresy, the planting of the Catholic religion, the delivery of our country of infinite murders, wicked and detestable policies by which this kingdom was hitherto governed, nourished in obscurity and ignorance, maintained in barbarity and incivility and consequently of infinite evils which are too lamentable to be rehearsed. This is an interesting passage because in doing so O’Neill turned the ideology of Tudor reform, predicated ostensibly upon the goal of eliminating ignorance and incivility, upon its head. O’Neill also invoked Pope Pius V’s excommunication of Elizabeth in 1570 which absolved subjects from their allegiance and referred to the example of France where Catholic subjects by maintaining war against their prince—the excommunicated Henry IV—had forced him to change his religion. The same document contains O’Neill’s only reference to himself and the kingship of Ireland but its nature is highly rhetorical—’I have protested and do hereby protest if I had gotten to be king in Ireland without the Catholic religion…I would not the same accept’. About the same time as the proclamation, O’Neill drew up a famous set of twenty-two articles. For the early modern period these stand as a remarkable series of nationalist demands and Sir Robert Cecil glossed them with the single word ‘Ewtopia’. The main beneficiaries would have been the great lords of Ireland, the Anglo-Irish gentry and townsmen, and the Catholic church. The vision here was not so much a Gaelic Ireland but an independent country, nominally under the English crown, guided by a mixture of the common law and Counter-Reform­ation Catholicism. O’Neill’s proclamation did not circulate much further than the northern reaches of the Pale and the twenty-two articles which were intended to represent a final negotiating position with the crown were never formally propounded. In these documents and other pieces of propaganda, the terms ‘Ireland’ and ‘Irishmen’ have a resonance and a deliberately unifying purpose. O’Neill had adopted the ideology of faith and fatherland for selfish not altruistic reasons. The Ulster leader had plainly come to the realisation that only a nationalist solution would provide long-term security for Gaelic lords such as himself and the other sections of the Irish body politic as well. The problem was convincing all sections of the logic of such a solution. O’Neill’s propaganda fell on deaf ears. Ironically the English speakers who had introduced the patriotic idea into Ireland refused to participate in its logical culmination. In 1600 O’Neill was formally recognised by the Pope as Captain-General of the Catholic army in Ireland with a plenary indulgence similar to that possessed by Fitzmaurice. This legitimised O’Neill’s Catholic patriot stance but even if he had been granted the ultimate sanction which he had requested—the right to excommunicate opponents—there would have been no rush by the Anglo-Irish to join his cause. For the Palesmen distrusted the Gaelic Irish more than they disliked the Protestant arrivistes from England. Their ancestors had shed blood conquering and defending their lands against the Gaelic Irish. Whatever their truck with Gaelic culture, they valued their Englishness and had ingrained habits of loyalty to the English crown. Their commercial interests, especially on the east coast, lay with England and their lands were secured by English law. They considered themselves not only more civilised but also by the same token better Catholics than the Gaelic Irish. At bottom they considered the Gaelic lords too tyrannical in government to be trusted with the leadership of a civil society. The Palesmen had the Baltinglass nightmare fresh in their memory, though it was soon apparent that they had made a bad choice. As early as 1602 Christopher Nugent, the lord of Delvin, who had remained steadfast in the face of O’Neill’s threats and blandishments, died imprisoned in Dublin Castle after being arrested on suspicion by fortune-hunting New English officials. At the time the state was very worried about which way the Palesmen would jump. It feared that O’Neill’s ‘seditious libel’ would cause an alteration in their hearts and minds. Bishop Thomas Jones of Meath composed a reply directed to the gentry of the Pale. The fact that it was ten times the length of O’Neill’s document demonstrates the government’s degree of difficulty. Jones’s reply recited the various Tudor arguments about obedience to the sovereign who was God’s anointed. It pointed out the ambiguities and hypocrisies in O’Neill’s claim to be defending and advancing his country and countrymen. It went into a long discourse about the inability of popes to depose monarchs from their thrones or absolve subjects from their obedience. Jones alleged that no Irish Catholics suffered because of their conscience. When he asked the Privy Council in London to peruse his reply, it set about composing a second answer to O’Neill’s proclamation. This was more sophisticated counter-propaganda than the bishop’s turgid sermon. It was written in such a way as to appear to be the work of ‘the honest Catholic lords of the Pale’. It echoed the incon­sistencies noted by Jones, alleged an ambition on O’Neill’s part to become king of Ireland and in one passage hit on the classical basis of O’Neill’s position by accusing him of deploying the heathen terminology of ancient Rome! The Privy Council’s refutation emphasised the education, civility and loyalty of the Palesmen which O’Neill was trying to subvert and, to prevent him succeeding on the basis of doing the Pope’s bidding, drew examples from scripture, the church fathers, church councils and the history of church-state relations to disprove the Pope’s power to depose princes. In the end, however, the Privy Council in London decided to publish neither reply. Both would have spread O’Neill’s ideas even further, and, in its own transparent attempt to argue the Palesmen’s case, the state came close to acknowledging the possibility of being Catholic and loyal, something it did not wish to admit. In fact O’Neill’s overt adoption of faith and fatherland scuppered the chances of a negotiated peace when, after the Essex debacle, there were clear signs of English war-weariness. The proclamation was an ideological bombshell. As a result the English state decided on the immediate dispatch of a new chief governor—Lord Mountjoy—and the relentless and expensive suppression of the Irish uprising which ended with O’Neill’s submission in 1603. Pope Pius V – his bull, Regnans in excelsis of 1570, was used by Catholic opponents of Elizabeth to justify their insurgency. The faith and fatherland ideology failed to win over the anglophone gentry and townsmen. However the many thousands fighting on the confederate side would have been exposed to it especially as a result of preaching. 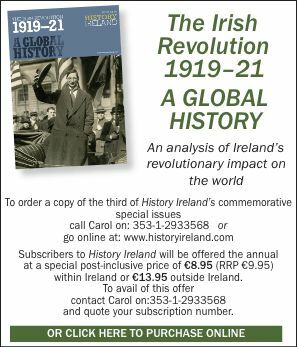 Furthermore the ideology did not die with Irish defeat but was transmitted to later generations by the faith and fatherland accounts of the conflict. The most sophisticated was De regno Hibernia, sancta insula, commentarius (Louvain 1632). Written in Rome by Archbishop Lombard of Armagh whilst the war was still raging to encourage papal support for O’Neill, it refuted various falsehoods propagated by the English about Ireland and the Irish. It showed how schismatic and heretic English kings empowered by the papal bull Laudabiliter had destroyed the island of saints and scholars. Basically it was a history of faith and fatherland and the Nine Years War was the latest and highest manifestation. Though Lombard later changed his views to reach an accommodation with the new Jacobean regime, it was this nationalist history amongst all his scholarly works that his old university of Louvain chose to publish posthumously. It was promptly banned by the authorities in London and probably did not circulate widely. A more populist and far more inaccurate rendering of the Nine Years War had already been given by Philip O’Sullivan Beare who fled Ireland as a child after the defeat at Kinsale. His major work, Historiae Catholicae Iberniae Compendium (Lisbon 1621) conceived independently of Lombard had a similar historical framework and lots of Catholic martyrs. The third faith and fatherland account of the war was Ludhaidh Ó Cléirigh’s Beatha Aodha Ruaidh Uí Dhomhnaill which attempted to highlight Red Hugh O’Donnell’s role in the conflict at the expense of O’Neill’s. This manuscript was one of the sources used by the Four Masters when they compiled Annála Ríoghachta Éireann in the 1630s. These three accounts, notably O’Sullivan Beare’s, influenced future generations because they were used by later Catholic historians, notably James MacGeoghegan in the mid-eighteenth century. When Catholic nationalism re-emerged triumphalist in the nineteenth century, churchmen provided new editions of Lomb­ard (P.F. Moran, 1868), O’Sullivan Beare (M. Kelly, 1850), and the first printed edition of Ó Cléirigh’s life of O’Donnell (D. Murphy, 1895). It has been argued by Brendan Bradshaw that the work of Anglo-Irish commonwealth reformers in mid-sixteenth century was underpinned by a sense of patriotism refurbished by the new learning of the Renaissance. Its first outing in systematic form—rather ironically in view of later developments—was the distinctly Protestant and unionist version of Edward Walshe. Later when Catholic Palesmen became less sure of their national role, the idea was taken up in a militant Catholic form by James Fitzmaurice. Again ironically Sanders, an English Jesuit, may have been a key influence. During the Nine Years War Hugh O’Neill developed the concept further but it made no impact on the Palesmen who had originated the patriot ideal in Ireland. While it is possible to make too much of faith and fatherland in this era it plainly did exist and cannot be wished away. And once the idea had been conceived, it persisted. Its emergence shows that Irish leaders were not passive victims of a relentless colonial juggernaut. They could take the initiative. Not only did they struggle physically against the forces pitted against them but, drawing on the European mainstream, they could not only set the agenda but radically alter the terms on which it was based. It is widely asserted that nationalism started with the French revolution and is synonymous with the national consciousness of the masses. This discounts the Renaissance rediscovery of patria and the confessional nationalism of the Reform­ation. Indeed it might be argued that partisan histories of the Nine Years War, by transmitting the Irish variant of ‘faith and fatherland’ to later generations, played their part in the creation of modern Irish nationalism. Hiram Morgan is research fellow in history at the University of Ulster, Coleraine and joint editor of History Ireland. B. Bradshaw, The Irish constitutional revolution of the sixteenth century (Cambridge 1979). C. Lennon, Richard Stanihurst the Dubliner, 1547-1618 (Dublin 1981). H. Morgan, ‘Hugh O’Neill and the Nine Years War in Tudor Ireland’, in Historical Journal, 1993. H. Morgan, ‘Faith and fatherland or queen and country: an unpublished exchange between O’Neill and the state at the height of the Nine Years War’, in Dúiche Néill: journal of the O’Neill country historical society, 1994.